PlayStation Classic Coming in December | Nerd Much? Nearly 25 years after its initial launch, the original PlayStation is back. 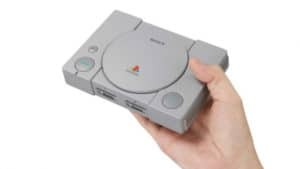 Sony has announced that they’re rolling out a PlayStation Classic mini console just in time for Christmas. I have no idea where a fantastic idea like this could have possibly come from. Obviously inspired by the Nintendo NES and Super NES Classic Editions, the PlayStation Classic comes equipped with 20 pre-loaded games from the iconic PlayStation line up. The full list of games hasn’t been revealed yet, but the catalogue includes Final Fantasy 7, Tekken 3, R4: Ridge Racer Type 4, Jumping Flash!, and Wild Arms. The system itself is said to be roughly 45% smaller than the original PlayStation and “perfectly mirrors the original console.” There are no discs to insert, but the Open button still serves a purpose as a way to swap between games within the system’s library. The PlayStation Classic utilizes an HDMI port in the back to connect to your television. And it comes with two original PlayStation controllers that connect to the front of the system via USB. Memory Card ports are still there aesthetically but aren’t functional as saves are stored internally. Oddly, the PlayStation Classic does not come with a USB AC adaptor to power the device. But with the millions of them in existence to charge our phones you likely have an extra lying around the house somewhere. The PlayStation Classic is being priced at $99.99 and will release on December 3rd. In comparison, Nintendo’s Super NES Classic goes for $79.99. The likely inevitable Nintendo 64 Classic Edition has been rumored for a while, and will probably be priced similarly to the PlayStation Classic if it ever happens. It would be amazing if a N64 Classic were to arrive this holiday season to see these two gaming rivals go at it once again.